10.1.1941: Ordered. A/S trawler based on commercial GULLFOSS. 8.10.1941: Launched by Cochrane & Sons Ltd, Selby (Yd.No.1239) (“Fish” class) for The Admiralty as BONITO (P.No.T231). 3.4.1942: Completed as a A/S trawler/minesweeper (1-4”, 3-20mm). 1946: Sold to Consolidated Fisheries Ltd (64/64), Grimsby. 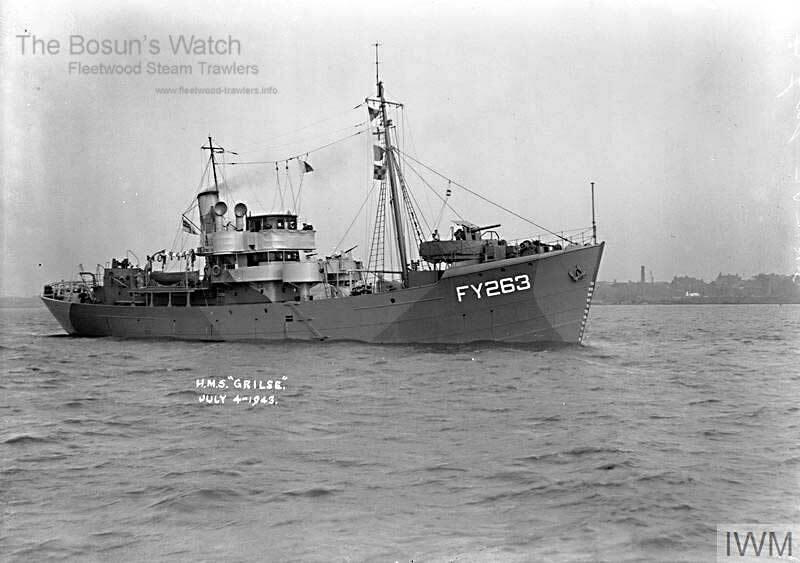 4.2.1947: Registered at Grimsby as BLAEFELL (GY456). Official No.166657. 650ihp. 4.2.1947: Thomas Rowan Ronald appointed manager. 11.3.1947: Sir John Denton Marsden, Bart appointed manager. 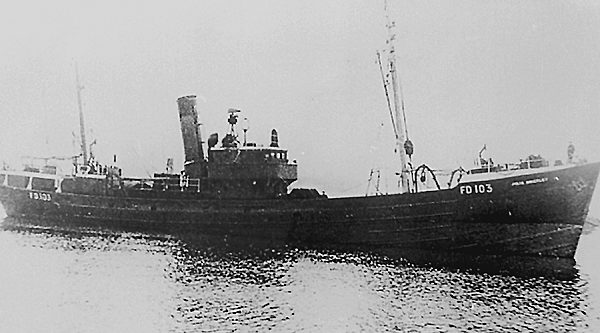 31.12.1954: Sold to The Clifton Steam Trawlers Ltd (64/64), Fleetwood. 5.1.1955: John ? Channock, Cleveleys appointed manager. 6.1.1955: Registered at Fleetwood (FD40). 28.6.1956: Company taken over by Boston Deep Sea Fisheries Ltd, Fleetwood. (Fred Parkes, Blackpool, manager). 5.9.1956: Sold to B. Gelcer & Co (Proprietary) Ltd, Cape Town. 1956: Registered at Cape Town (CTA387). 12.1956: Registered at Cape Town as BENJAMIN GELCER (CTA387). 2.1967: Stripped of all usable parts and non-ferrous metal and scuttled off Cape Town. Cape Town registry closed. 18/05/2012: Page published. 9 updates since then. 15/10/2017: Removed FMHT watermark from image. 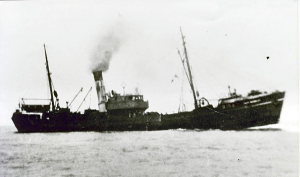 This entry was posted in Lost Vessels, Steam Trawlers, Steamers (Picture) and tagged Boston DSF & I, Clifton ST, Fish Class, Lost, Parkes on May 18, 2012 by Fred Smith. 24.12.1942: Keel laid. 6.4.1943: Launched by Cochrane & Sons Ltd, Selby (Yd.No.1265 ) (“Fish” class) for The Admiralty as HMS GRILSE (P.No.T.368). 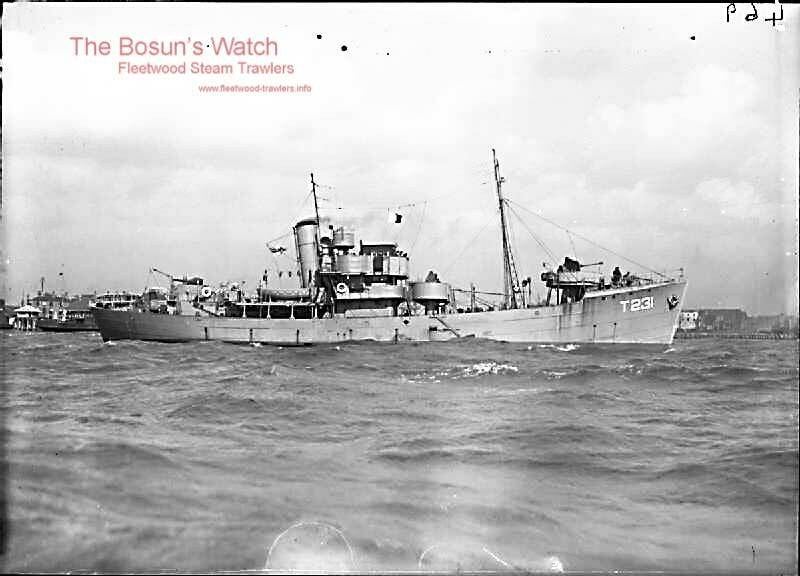 5.7.1943: Completed as an A/S trawler (1-12pdr HA/LA, 3-20mm, ASDIC, DC). Based Mediterranean (Act Sk. Lieut. George Main RNR). 28.11.1944: Ty Act. Sk. Lieut. 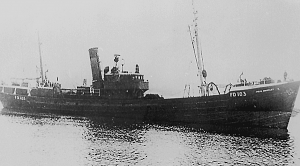 Harold Chandler RNR appointed Co.
1946: Laid up at Rosyth on Disposal List (SORF, Rosyth). 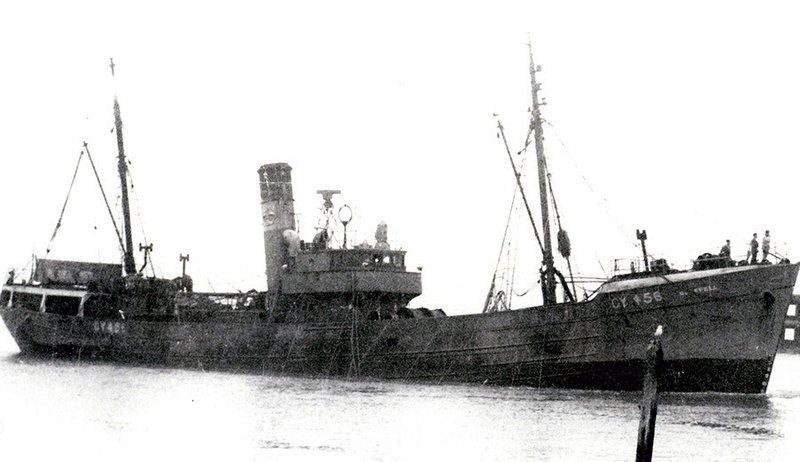 20.5.1946: Sold to Consolidated Fisheries Ltd, Grimsby for the sum of £18,858. Converted to steam trawler at a cost of £26,239. (Total £45,096). 2.1947: Registered at Swansea as CARDIFF CASTLE O.N.168578 (SA66). 380g 142n. Sir John D. Marsden, Bart, Lincoln designated manager. Insured for £75,680. 6.1947: Converted for burning oil fuel, F.P. above 150° F.
1952: Sold to The Clifton Steam Trawlers Ltd, Fleetwood. 08.5.1952: Registered at Fleetwood (FD103). 13.07.1952: Registered at Fleetwood as JULIA BRIERLEY (FD103). John ? Channock, Cleveleys designated manager. 6.7.1956: Company taken over by Boston Deep Sea Fisheries Ltd, Fleetwood. Fred Parkes, Blackpool designated manager. 11.1957: On the St. Kilda grounds (Sk. Jim Port). Bosun, Michael Quinn (28) taken seriously ill with a suspected perforated appendix. Sk. Port radioed the missile tracking station on the island of Hirta and the RAF doctor advised that the Bosun should be landed there for attention. During the night a severe gale blew up and they had to dodge for two days until the weather abated. The sick man’s condition deteriorated and he was in need of immediate medical aid. 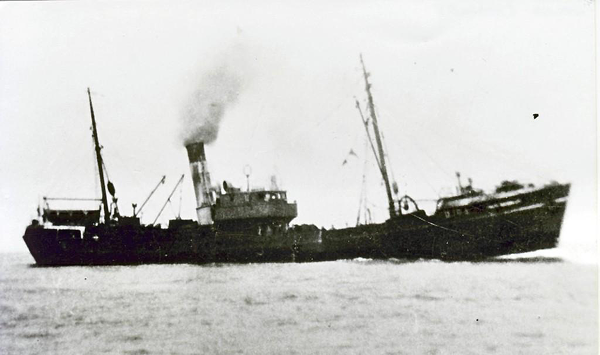 Coming into Parson’s Bay, Hirta, the boat was launched and under the mate, Bill Cossey and six crew they landed on the beach and the sick man was transferred to the hutments. The skipper was advised that the Bosun should be kept on the island and that they were best to continue fishing and pick the man up on the way home. After twelve days they returned and picked up the Bosun who had been under observation and kept comfortable with injections and also took onboard mail from the twenty-eight servicemen stationed on the island. On return to Fleetwood Mr Quinn visited the hospital for a further check up and to see if an operation was necessary. 20.8.1958: Sold to Boston Deep Sea Fisheries Ltd, Fleetwood, Sir Fred Parkes designated manager. 10.1961: Sold to Ets van Heygen Frères SA, Brugge, Belgium for breaking up. 14/01/2009: Page published. 5 updates since then. 01/04/2017: Added images and removed FMHT watermark. This entry was posted in Steam Trawlers, Steamers (Picture) and tagged Boston DSF & I, Carry On Fishing Co, Clifton ST, Fish Class, Parkes on January 14, 2009 by Fred Smith.